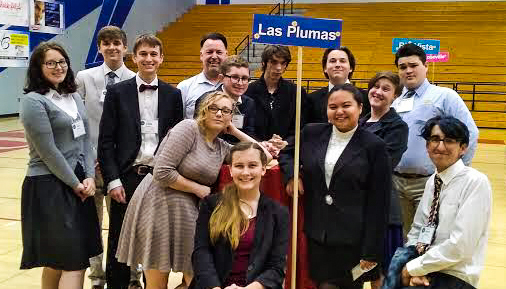 OROVILLE — Oroville Union High School District's Las Plumas High School won the 2019 Butte County Academic Decathlon held February 4. The team scored 34,209.90 points, earning the school the county title this year. The winning team includes Justin Hickman, Sydney Howard and Hailie Lozano in the Honors Division; Mackenzie Waxman, Samuel Simpson and Kryzel Dequito in the Scholastic Division; Damon Stott, Devin Bruce and Maxwell Garcia in the Varsity Division. The team will represent Butte County and pursue a state title at the California State Academic Decathlon, March 22- 23, 2019, in Sacramento, California. In all, 49 students representing 4 high school teams from Butte County competed in this year’s Academic Decathlon. INSPIRE School of Arts and Sciences, Las Plumas High School, Oroville High School, and Paradise High School. Teams are comprised of three divisions; Honor students (3.75 and above GPA), Scholastic students (3.00&dash;3.74 GPA), Varsity students (2.99 GPA and below). Students compete against other students in the same grade point category, with bronze, silver, and gold medals being awarded for each of the 10 events. Second place was awarded to Inspire School of Arts and Sciences, third place was awarded to Paradise High School, and Oroville High was acknowledged for its participation. Best wishes to Las Plumas High School in their future adventures representing Butte County in Sacramento.